Julian Rogers is a Google certified, award-winning communications consultant with 20+ years of experience in employee / business / marketing communications; freelance writing and editing; social media / multi-channel marketing; promotions and brand management. I am a writer, editor, web publisher and communications strategist. I enjoy working as an independent communications consultant and as an employee of companies that value high-quality, effective and emotionally resonant business communications. 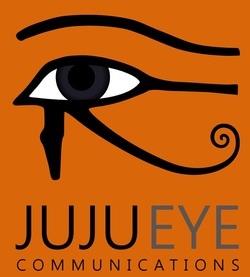 I am the principal in a communications consulting business, Juju Eye Communications, the publisher and editor of The Hit Job magazine and the founder of the professional business group Marketing Communications Leadership. I combine my entrepreneurial focus with superior written communication experience. I employ the written word, 2D design and presentation skills in forging partnerships with stakeholders, partners and vendors. I have directed and administered budgets of up to $750,000; bringing together ideas and talent to produce successful projects and events as a decisive team leader and collaborator. I know what it is to be a writer. My expertise comes from a variety of industries, including media/publishing, health care marketing, health science research dissemination, transportation, engineering/manufacturing, staffing, government, and non-profit sectors. I have extensive experience writing / editing / publishing online and print news, features, profiles and blog articles; ensuring accurate, timely and effective communication with clarity, superior organization and search engine-optimized content. I am a stickler for adherence to style, grammar, layout and design, and work with organizations to formalize and clarify their style. I am a copy editor at heart who can annoy you with nit-picky rule reminders and prop you up with well-aimed encouragement. Please take a few moments to look over my portfolio of work. Please feel free to offer your thoughtful comments in the contact section below. Let's make something that works.